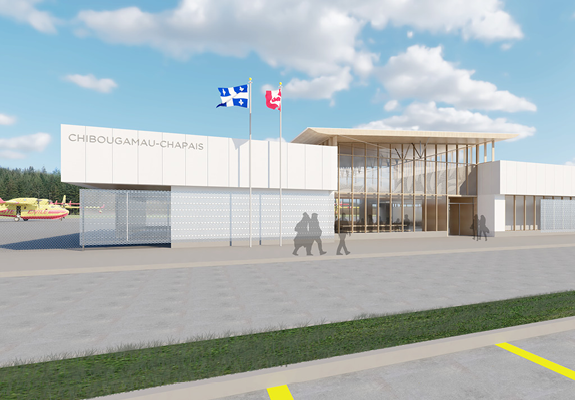 EVOQ + Artcad in joint venture are currently working on the development of the new Chibougamau-Chapais airport terminal. The project consists of the construction of a new 1,018 metres square terminal. It is comprised of a single volume building featuring recessed spaces that are sheltered by the roof ledges above the main entrance and in the baggage sorting area. The roof is further raised above the main public space, which faces south, providing additional natural light. 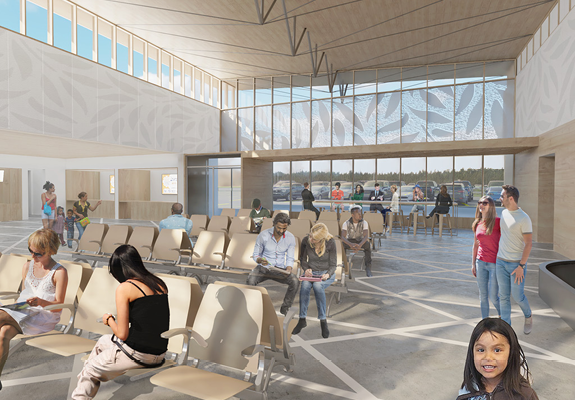 The proposed interior space is structured around a general waiting area flowing through the entire length of the building, from the parking lot to the runway. This central zone is a point of gathering for both passengers and those accompanying them, for both arrivals and departures. The waiting area is the common public space of the terminal and is the hub for all of its main passenger operations and services. Open visual pathways from the parking area to the runway benefit both departing passengers who can observe the arrival of their plane, as well as passengers who simply want to keep an eye on the runway sheltered from the weather. This important public space is enclosed by a naturally-finished, cross-laminated wood roof and is bounded on three sides by a structural wooden curtain wall.